Imagine coming face to face with an animal that looks almost like a panda. Now imagine that this “panda” has a mane, like a lion, but ears resembling those of Mickey Mouse. Then picture this creature with fur of gold and a white, moon-shaped crescent on its chest. You’d be picturing a golden moon bear—like no other bear ever seen before. When Sy Montgomery hears a story about this very strange and beautiful bear caged in Cambodia, she remembers another story she heard a year before: her friend, the biologist Gary Galbreath, stumbled across a caged golden bear while travelling in China. It couldn’t be the same individual bear—but could it be a kind of bear no scientist has documented before? Upon comparing photographs, one thing’s for sure: the possibilities are too exciting to ignore. 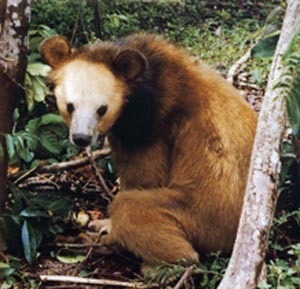 An expedition to Southeast Asia is planned, with hopes of discovering just what this golden moon bear might be. 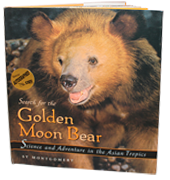 Join Sy Montgomery as she travels far and wide in search of the golden moon bear. Along with her research companions, she delves deep into the jungles of the Elephant Mountains, visits the bustling streets of Cambodian cities, explores remote villages, and attends a Club Med for bears in Thailand—all while carrying marshmallows and tweezers for her encounters with the bears along the way. The quest for the golden moon bear takes us on an exhilarating journey and chronicles the detective work and science behind track an unknown creature in a different part of the world, where bears are kept as pets and where sometimes things aren’t quite what they seem…. "This is a natural...for young environmentalists and animal lovers, as well as readers who just like a good science mystery." —Bulletin for the Center for Children’s Books"This attractive and informative offering is an intelligent reportage of science as it happens." • The New York Public Library, selecting it as a Read and Share book for 2004. • The National Science Teachers Association and The Children’s Book Council, naming it as an Outstanding Science Trade Book for students K-12 for 2005. It received the further distinction of being noted as a "Selector’s Choice" among these outstanding works for children.